I recently wrote a rave review on George’s restaurant located in the Grove, making specific mention that his location in Sunset did not have the same quality of service. However, I feel that I need to revise this criticism after most my recent experience there for my graduation dinner. The place was obviously packed for graduation weekend (although it is packed almost every night of the week), and I was struggling to find the hostess amidst the large crowd waiting outside—as they don’t take reservations for parties less than 8 persons…a.k.a get there early! Suddenly, a rather stout bald man approaches me and assures me (in a charming French accent) that he will personally see to it that my family is seated within 15 minutes. Pleased to meet you, George! We headed to the bar, grabbed a round of cocktails, and sure enough he had us a table outside before we finished the drinks. This kind of attentive personal service is seriously lacking in Miami, so to be taken care of and treated in this way is infrequent and enjoyable. We were then each brought a complimentary glass of champagne before receiving our menus. Again, a nice personal touch that scores major brownie points with customers. Who doesn’t love getting free stuff? Especially, free alcohol!! To start, I ordered the Steamed Mussels with shallots and garlic in white wine sauce. This is the must try menu item. They come in a large le crusset pot, piping hot, with a decadent side of Truffle French Fries. I would estimate that about 50% of the tables you see will have an order of these mussels on them, because everyone loves them. 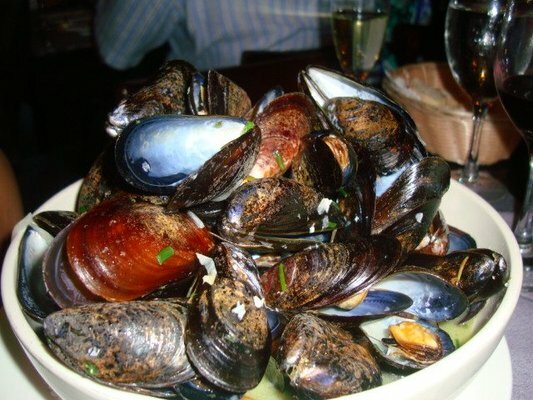 The mussels themselves are large and plump and the sauce is just outrageously good and flavorful. Next, I got an order of the French Onion Soup, which is prepared in the traditional way and served in a crock with baked gruyere and provolone cheeses atop sliced French baguette. 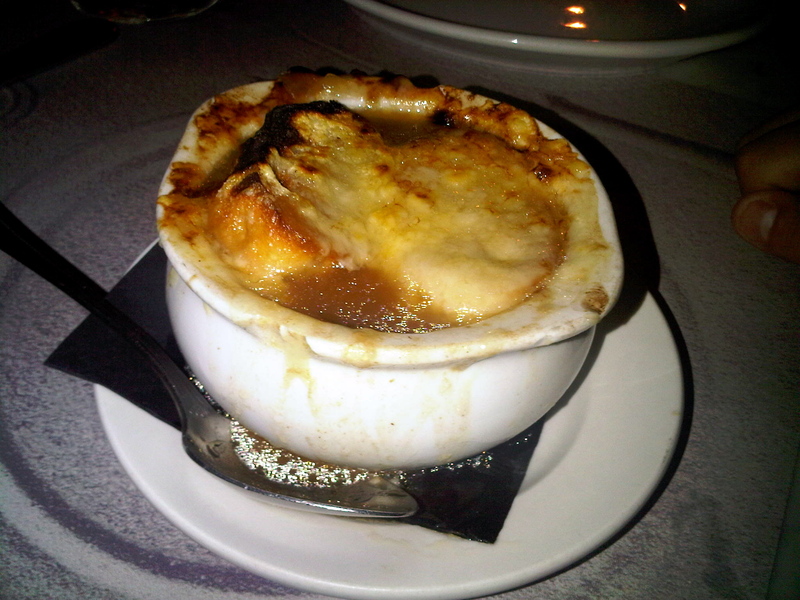 Although it is tasty, onion soup is onion soup in my opinion, and I would recommend trying some of the more unique menu items. For my “celebration entrée,” I thought that a nice steak was the most appropriate! I ordered the Angus Center Cut Beef Filet “Au Poivre” with Truffle Mashed Potatoes and French Green Beans (photographed at top). The steak was incredibly lean and buttery…each bite just melted in my mouth. And the sauce, although rich, was delicious. 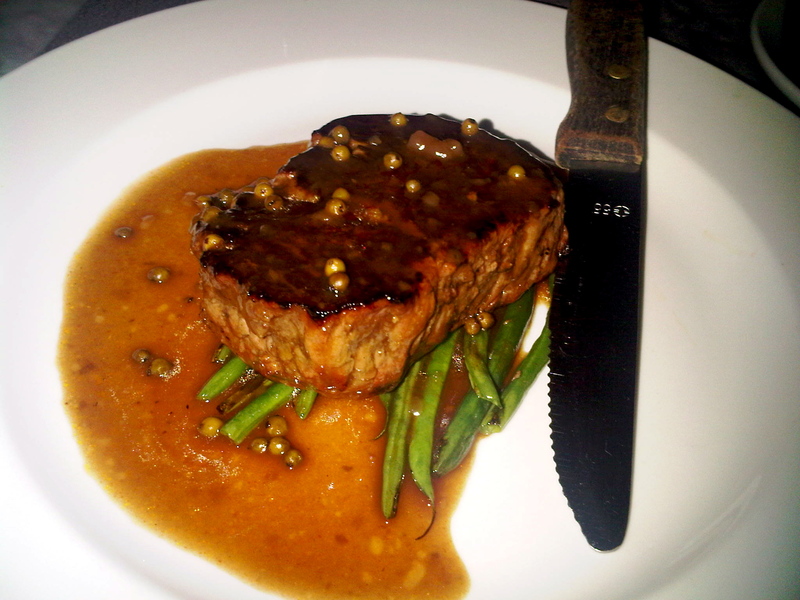 The cognac added a nice sweetness to the dish complimenting the pungent peppercorn crust on the steak. I was a little disappointed with the mashed potatoes however, which lacked in truffle flavor. I would get the potatoes au gratin instead next time. 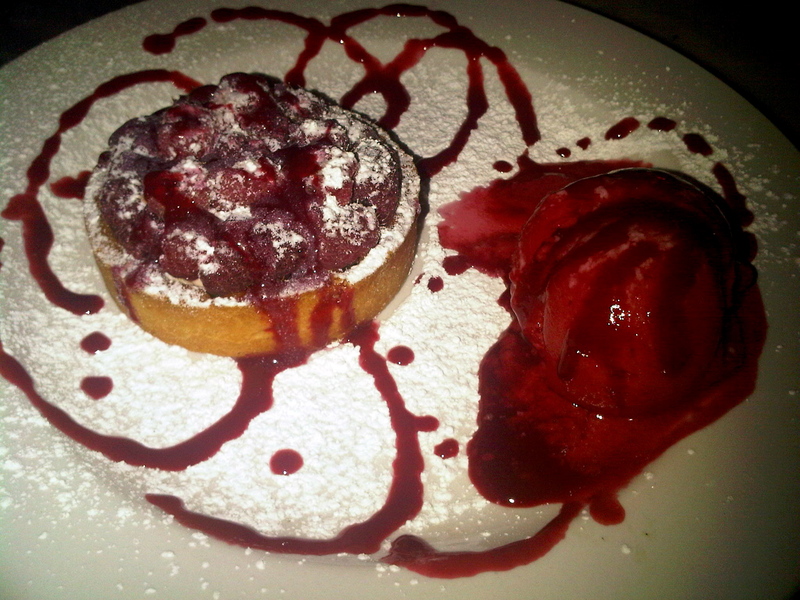 For dessert, we ordered the Raspberry Custard Tart with homemade Raspberry Sorbet. I really enjoyed the dessert, although my family thought the sorbet was a little too tart and sour. Guess it is a sheer matter of preference. Overall, I believe that George’s in the Grove is a more appropriate place for a dinner date and family dinner because it is a lot less noisey. But I take back my former harsh criticisms on Georges in Sunset, and recommend it as a great place for celebration dinners and drinks. The bar scene is much larger at the Sunset location, and on Wednesday nights you can watch the local Miami divorcee scene get smashed and mingle. Ohhh, and Wednesday night is ladies night, which means free champagne for women all night long! !